You’re sitting in the exam hall. Sigh. You’ve managed not to vomit up your breakfast but you’re beyond caring how English paper 1 goes as long as it’s Gone Girl sometime soon! At this point, it’s tempting to choose ‘safe’ options when it comes to the functional writing and creative writing elements of the paper – a letter, a report, a leaflet or a newspaper article. I’m not saying don’t do it: it can be calming to select a format and layout that’s familiar and relatively straight-forward. However, I do have a few words of warning. Simply replicating the conventions of the format you’ve chosen isn’t sufficient if you’re looking for a high grade. 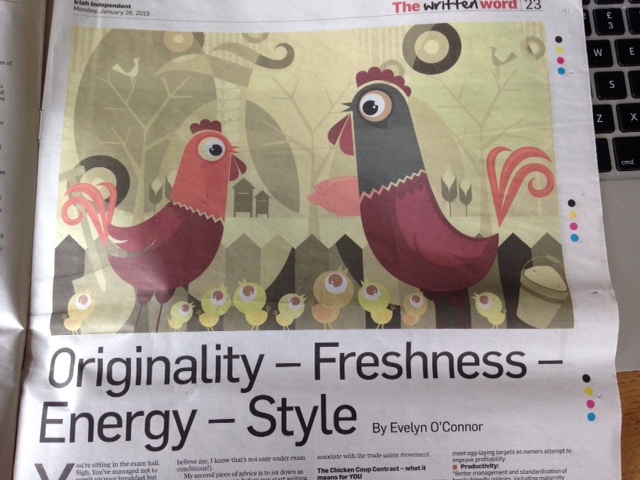 It’s a good start but it’s not enough because as well as gaining marks for ‘understanding genre’, ‘creative modelling’ and ‘control of register and shape’, your writing will also be assessed for ‘originality’ ‘freshness’ ‘energy’ and ‘style’. With this is mind, how do you engage with the set task but also make your writing stand out in a sea of sameness? My first piece of advice is to internalise the conventions and layout for each format so that you’re not grasping for these elements in the exam. If they flow naturally, then you’ll be able to free up your creative energies to focus on making your writing fresh and original (and believe me, I know that’s not easy under exam conditions!). My second piece of advice is to jot down as many ideas as you can before you start writing. As a general rule, the first things that spring to mind for you will likely be similar to the first things that spring to mind for everyone else too, so push your brain to go beyond the obvious first few ideas that you scribble down. Lastly, if you do come up with something quirky and off-beat, make sure it’s still relevant to the set task and that your register (the formality of your tone and of the language you choose) is appropriate to the audience who’ll be reading what you’ve written. Achieving this balance is quite difficult and requires skill so practise, practise, practise as much as you can prior to the exam. Let’s imagine a QB as follows, with a quote from the text that precedes it and then a writing task for you to complete. Compose a leaflet encouraging people in your community to rally against an injustice you feel must be challenged. Below, here’s a sample leaflet which achieves a certain freshness and originality, whilst also obeying the expected layout and register. 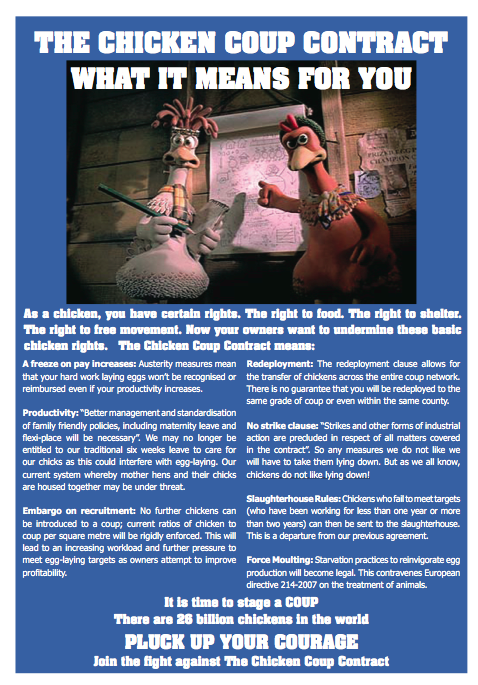 In terms of ‘creative modelling’ it’s borrowing from the movie Chicken Run but it nonetheless uses the formal vocabulary that we associate with the trade union movement. As a chicken, you have certain rights. The right to food. The right to shelter. The right to free movement. Now your owners want to undermine these basic chicken rights. Austerity measures mean that your hard work laying eggs won’t be recognised or reimbursed even if your productivity increases. The redeployment clause allows for the transfer of chickens across the entire chicken coup network. There is no guarantee that you will be redeployed to the same grade of coup or even within the same county. “Strikes and other forms of industrial action are precluded in respect of all matters covered in the contract”. So any measures we do not like we will have to take them lying down. 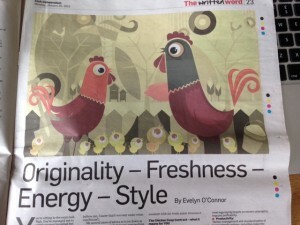 But as we all know, chickens do not like lying down! No further chickens can be introduced to a coup; current ratios of chicken to coup per square metre will be rigidly enforced. This will lead to an increasing workload and further pressure to meet egg-laying targets as owners attempt to improve profitability. “Better management and standardisation of family friendly policies, including maternity leave and flexi-place will be necessary”. We may no longer be entitled to our traditional six weeks leave to care for our chicks as this could interfere with egg-laying. Our current system whereby mother hens and their chicks are housed together may be under threat. Chickens who fail to meet targets (and who have been working in the coup for less than one year or more than two years) can then be sent to the slaughterhouse. This is a departure from our previous agreement. Starvation practices to re-invigorate egg-production will become legal. This contravenes European directive 214-2007 on the humane treatment of animals. If you weren’t in an exam, you could do include some fancy graphic design elements, as below, but in an exam it’s not necessary (although, I might vary the size of the heading, sub-heading etc). The writing will speak for itself and the look of it isn’t relevant – you’re not sitting an art exam.